Recently I was contacted by the beautiful Myah from the beautiful blog Myah Rebecca! She asked me whether I wanted to join her in a blog collaboration and I happily agreed! 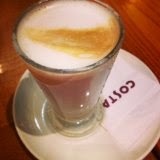 She came up with the lovely idea of doing a lifestyle post on the autumnal selection of drinks at Costa and Starbucks! I decided to take a trip to Costa with my friends and try out their specialty drinks, and she went to Starbucks. Read through my opinions on these drinks below and then click the link at the bottom to follow on to Myah's post on Starbucks. Enjoy! Firstly I ordered the Roasted Hazelnut Latte. The lovely nutty taste was very autumnal and warming; a lovely milky latte is the perfect solution to warmth on an autumn day! Although, I did find the drink a touch too bitter for me so I would recommend adding some sugar. Then I ordered the Hot Spiced Apple. The gorgeous spiced cinnamon stick and star anise floating at the top of the glass was very seasonal and added a lovely aesthetic touch. The aromatic smell gave me a warming glow and the taste was very sweet and soothing. My friends decided to go for the coolers! Not very autumnal, but delicious drinks, so I decided to include them in this post. The two flavours shown above are strawberry and cream, and caramel latte. They are two coolers you can rely on to taste great! My personal opinion is that they are very sweet so I can only really order a small. Now click on the link below and read Myah's experience at Starbucks! I'd like to thank Myah for asking me to do this collaboration, it's been lots of fun!